Come ride with us! Western performance horses and Western Dressage lessons available for all ages and abilities. Private Lessons are available by appointment. 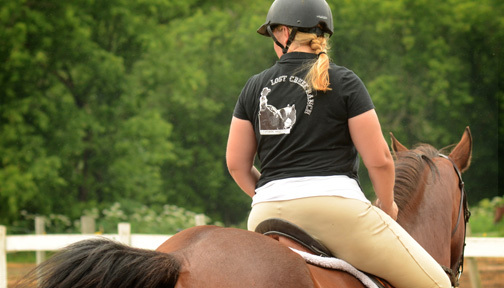 Lessons are 1 hour which includes tacking your horse, supervised warm up and riding instruction to improve your balance, feel, timing and understanding of aids to advance your riding. Private Lessons with Lynette Weldon are $60. Lynette's specialty is training soft, responsive horses and riders to learn feel and timing in order to advance their riding ability. You can ride Western, English or both. 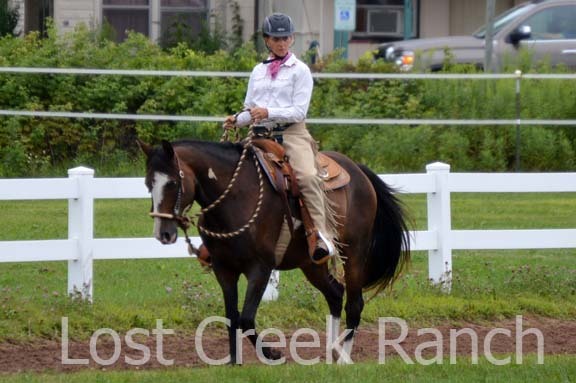 Lynette's lesson horses range from beginner friendly to advanced reining and finished bridal horses. Students of Lynette's first master balance and riding with their seat then progress to understanding contact and eventually asking for and understanding real collection, what it means, how it affects the horse and why it is the ultimate goal in riding and training any horse. 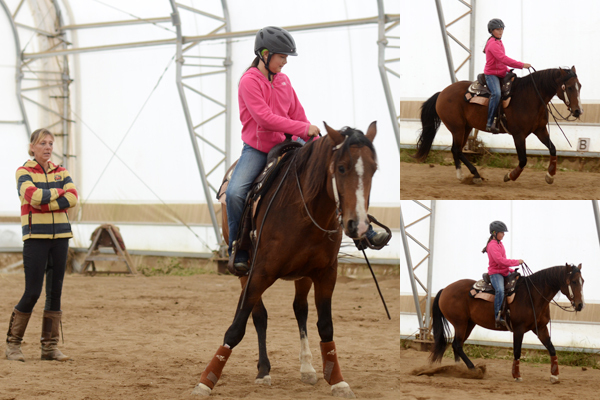 The objective for Lynette is that her students learn to ride with perfect timing and feel. If you are ready to take your riding to the next level private lessons with Lynette will get you there. Youth Reining Lessons and Adult Reining Lessons on finished reining horses. 45 min lesson. Learn spins, sliding stops, flying changes and more! 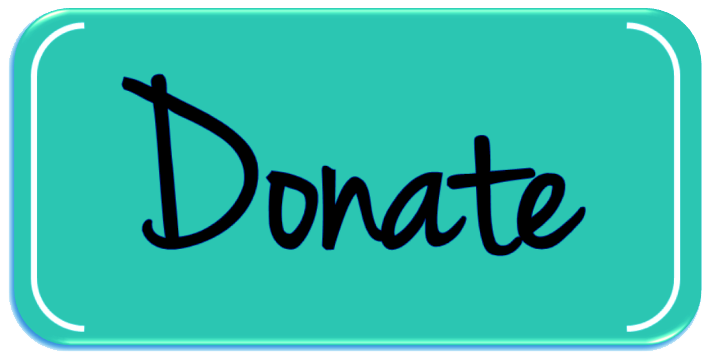 Dressage and Western Dressage exercises and training benefits all horses and riders. Learn how to ride the movements, why they are important and how they will increase your horses athletic ability, endurance and mental focus. Dressage/ Western Dressage is the focus of many of our show team riders including our beginning walk/ trot team. Our team competes at several shows each season. See more on our show team page. Meet T-Bone our little friend- the mechanical cow. T-Bone helps horses and riders put a purpose to the working cow horse movements western lesson students learn including sliding stops, rollbacks, turns and pivots. Horses and riders learn to "read" the cow and move with it in preparation for working real cows in the sorting or cutting arenas. Are you tired of going around in endless circles in the arena? Are you a pleasure riding looking for a challenge? Western Dressage offers you and your horse a way to build your skills and advance together without the bordom of rail work. 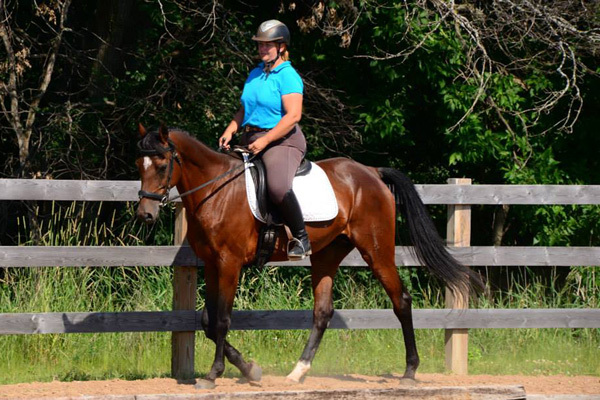 Western Dressage uses many of the principles of Classical Dressage which slowly build skills and fitness in both horse and rider as they progress up the levels. Our show team competes in local and national Western Dressage shows, Western Dressage is open to everyone starting at walk/ trot. 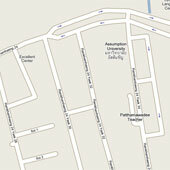 We welcome you to come see what it's all about. Lynette with youth student Hanna at the Western Dressage World Show. Hanna has been riding at Lost Creek Ranch since she was 9 and at 13 earned two Res. 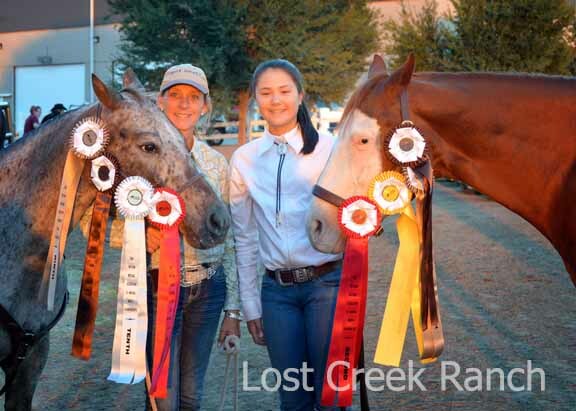 Champs and (8) Top Tens on two horses owned by Lost Creek Ranch- Hottie and Bella. Ruth teaches beginner lessons for youth and adults. 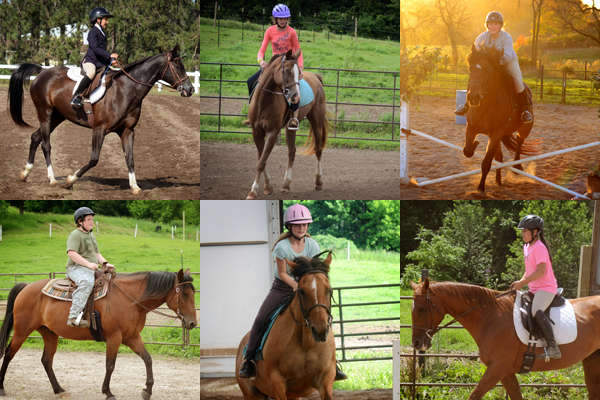 She has been a student of Lynette's for years and has a passion for equitation and building confidence in new riders. 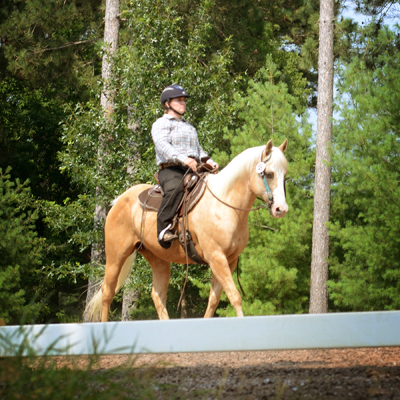 Ruth started riding as an adult and therefore is uniquely qualified to work new riders through the ups and downs of learning. 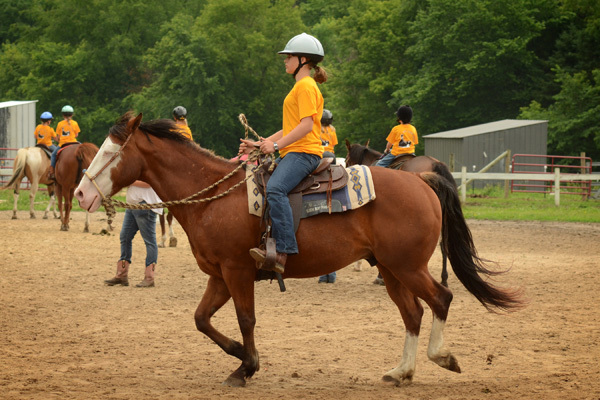 Ruth encourages her riders to work on their balance and position while having fun, being independent and getting excited about sharing their lives with horses! Youth riders working on developing a balanced seat and understanding how to cue and move each part of their horses body. Beginner private lessons with Ruth are $40 and she teaches youth group lessons ($30) and assists with the horsemanship and day camp programs.